Here's a slight variation on the global comp for Season 7, and one that performs extremely well in both an arranged team and a solo queue setting. This team excels at using crowd control to lock down multiple enemies (or one very unlucky one). It also has the power to initiate from distances that are normally much too far in the fog of war to anticipate and generally has the capacity to be an extreme nuisance in any scenario. Jhin [Marksman] - Jhin's long range initiation via his ultimate can also be used as a finisher. 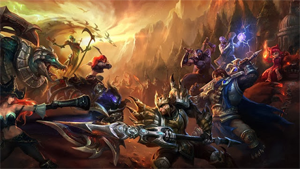 However, once he lands an ultimate charge, it's nearly impossible for enemy champions to avoid getting smashed by Sion and ultimately dominated by multiple global teleports. In his current state, Jhin is also extremely strong by himself as a result of the latest buff to lethality in Patch 7.2. His massive crowd control also synergizes extremely well with Sion in lane, and can take down multiple targets with ease. Twisted Fate [Mid] - Many people tend to underestimate the raw damage that Twisted Fate can put out and solely think about him in terms of his ultimate. Nevertheless, his ability to clear waves and take down targets with Lichbane make him extremely powerful as a mage in his own right. Meanwhile, towers fall very quickly to a few empowered blue cards which allow this team to snowball off one or two successful ganks. Sion [Support] - Support Sion was always a champion with good potential as a result of his free stats and excellent crowd control. However, players haven't really started picking him up until this year as a potential counter to Malzahar support. In this team composition, his long-range ultimate allows him to engage enemies at will, even when they can't see him on the map. After pulling the enemy team's attention away, Twisted Fate and Nocturne are free to jump in for quick kills. Following up Sion's ultimate with Shen makes Sion nearly impossible to kill, even with his lower gold totals as a support. Nocturne [Jungler] - On a team packing a Shen, this team needs an extra source of damage in order to take out targets during the crowd control duration. Nocturne works extremely well as a diver, especially once the enemy team uses up their peel on Sion and Shen. Shen [Top Laner] - Shen by himself happens to be an extremely safe pick that works well against most meta champions. However, don't expect him to do too much in lane, as its really his post-6 where he starts shining. Once he picks up his ultimate, push the enemy team into forced aggression as soon as possible in other lanes, where they will either be too scared of Twisted Fate and Shen to fight back, or they'll learn quickly why you can't trade when their ults are up. This team has extremely good global synergy, but don't feel like you need to use every single cooldown if just a few will do the trick during the mid-game. Push towers as quickly as possible to snowball the game. Pick up multiple sweepers, this power of this team lies in its unpredictiability. If you want to beat this team, it's key to pick up champions that are either difficult to be picked off, or are too tanky to assassinate. Ahri [Mid] - Sometimes you can catch Ahri, sometimes her triple dash on short cooldown melts your face while she spams her mastery emote. Hecarim [Jungle] - As a powerful ganker, his AOE crowd control can also prevent the enemy team from fighting an organized team fight. Nautilus [Top] - One of the strongest peelers in the game, Nautilus is one of the few champions that can potentially keep your team alive by himself. Nami [Support] - Not only can her ultimate instantly counter Jhin's ultimate, it can also prevent Shen from engaging on your team. Just don't throw it solo at a Sion ultimate. Vayne [Marksman] - Against a team as tanky as this, you're going to want to pick up the tank slaying master herself. Her powerful mobility will also be a strong deterrant against the global ganks. If you're REALLY good, you can also input buffer your condemn to prevent the Shen taunt.